Have them work elsewhere for at least five years. They need time to mature, becoming their own individuals, and to gain confidence learning and doing things as distinct human beings rather than just children of successful parents. Kids need to learn how to work, to be punctual, to earn their own money and to be held accountable. Everyone wins when potential successors have excellent training and gain skills and confidence outside the nuclear family. Consider this scenario: A family-owned restaurant in a small town occasionally has three generations working together on a Friday night. The children are under the age of 16. Assuming that child labor laws have been taken into account, the family is content that they are passing on a tradition and family trade. The kids work one or two nights during the weekend. In this example, the family is limiting the number of hours, and their expectations are reasonable. It’s a way for children to learn the family business and helps them gain self-respect. Indeed, one adult who remembers working with his mother in a greenhouse when he was 12 and 13 recalls that the job was hot, dirty and exhausting. However, he recalls he got paid for the work he did, and it gave him a greater appreciation for the work his parents did to support their family. Understand generational differences. Today’s young people are far more likely to want to work to live rather than adopt their parents’ “live to work” attitude. That’s why your adult children don’t want to work 80-hour workweeks. Younger children and other employees are most probably looking for a different workplace experience. Give psychometric assessments to make their personalities/capabilities fit their jobs. One child may be temperamentally unsuited for a position demanding detail and strict deadlines; he or she may be more of a big-picture, laissez-faire personality. Assessing such things will go a long way to improving both business function and family harmony. Hold them accountable, but not to an unreasonable standard. Give your kids crystal-clear roles and responsibilities and regular reviews so they know whether they’re living up to their job descriptions. The biggest morale killer in small businesses is underperforming or dysfunctional family members who are allowed to meander through various roles with virtually no accountability and to inflict themselves on others in your organization. In that case, pruning the family tree almost always results in improved business productivity. Communicate formally and regularly with a third-party facilitator. Virtually every family employee thinks he or she works harder and contributes more than anyone else and stews over this. 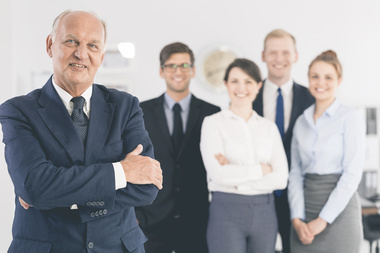 Family businesses have a greater need for formal communication to resolve perceived contribution issues, especially if you decide a family member is ill-suited to working at your company. You need to be able to discuss volatile topics constructively and productively. Seek the help of a talented facilitator to get the most from your family business. It can be a wonderful experience for all involved to have your children work with you. Just remember that it’s a delicate balancing act that needs your attention.